The courtship display of the Black-billed Amazon is unlike that of others of its kind - the male charges at the female and sways from side to side with a stiff-legged awkward motion, sometimes jumping over the female. 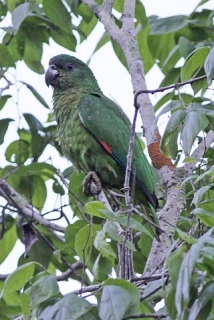 Male-plumage green with yellow/green on underparts; neck feathers softly dusted with black; red primary coverts; green tail with red at base. Bill grey, paler at base. Eye ring dark grey, eye dark brown. Female-as in male but with some primary coverts green instead of red. As in adults but all primary coverts green. Bugling while in flight. While perched growls and rumbles. Other notes sharp and screechy. Call notes higher pitched than calls of Yellow-billed Amazon. 4 x 1.5 x 2m (13 x 5 x 6.5 ft) enclosure with metal construction. Seed mix such as: millet, canary, wheat, oats, limited safflower and sunflower, canary grass seed; limited pine nuts; fruits such as: apple, pear, banana, cactus fruits, kiwi; vegetables such as: carrot, celery, green beans and peas in the pod; berries such as: rowan (mountain ash), elder, rosehips; mineral supplements particularly A and C; green leaves such as: kale, Swiss chard, lettuce, dandelion, chickweed; complete kibble. Provide bird-safe branches (fir, pine, etc), wood and vegetable tanned leather chew toys, ladders, swings, foraging toys. Vertical box 10" x 10" x 24" (25.4cm x 25.4cm x 61cm). Increased cultivation for agriculture, logging and possibly mining have resulted in much reduced habitat. This species is also trapped as a food source locally. There is also predation by yellow boas. Trapping for the wild bird trade appears to not have had much effect. Found in Jamaica, West Indies. Found between 300-1200m (984-3936 ft) in wet limestone forest; also found in agricultural plots in forest and cultivated areas at forest edge. Feeds on seeds, fruits, berries, leaf buds and blossoms; also ripe plantain, Musa, Cecropia, Ficus, Nectandra, Bryophyllum, Blighia sapida and Melia azedarach. Found in flocks of 6-40 individuals or more. Roosts communally, rising at sunrise with much noise and high-flying. Feeds in middle to upper storeys of canopy. Resident, with local wandering according to food availability. Courtship late January-February; nesting March-May.